The Hammer Band is a non-profit organization that started in 2007, as renowned violinist’s Moshe Hammer’s response to Toronto’s tragic ‘Summer of the Gun’. Believing in the power of music and music instruction to help kids change their tune, he walked into a public school in the Jane/Finch corridor and offered to teach there. Today, with five other professional musicians, The Hammer Band is in 40 schools reaching more than 1000 children in grades four through high-school. They take free lessons on donated violins in classrooms within the safety and security of their own school settings. Many of them have been with the program since its inception, with more joining every year as resources allow. Plans are to expand to numerous Toronto schools (and beyond) to introduce hundreds of kids to violins, other instruments, musical performances and the power of team-work. Through learning music together, they learn the art of listening, focus, self-discipline, tolerance, working towards a goal and working together in harmony as a community. 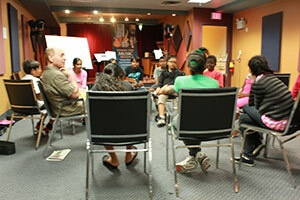 Inspired by the strong desire to make a difference in neighbourhoods where kids live in fear of or are influenced by gangs, violence and drug abuse, Moshe Hammer and his team of music teachers hope to show these kids options to violence, keep them off the streets and help them work towards a bright future.